I was helping my friend, Eunice <3 to earn more gummies and get a star at Hawaii. And it`s been a while since I went there O_O and yeah! I danced along with the Hawaiian fire dancers! It was sooo fun!! We also went at Edo and it takes a lot of time before my friend get a star, and I walk together with the Edo People. I was CAUGHT!! HELP!! "FAKE EDO PRINCESS" . I was stocked on the block while I was working for my 3rd room! Gosh! And that was the time after we took some pictures for my blog :/ But not really stocked. After I removed those blocks.. I can move again XD LOL! I really love to see our pets like this! They are so sweet!! I don`t know but.. they always go up on top of that caterpillar and sit together :O lol! My sis and I spent the Ameba Pico`s 1st Anniversary with Chocolate Pico. YES, she`s the one who share free gifts and foods to us and she really help us a lot.. specially now. Ameba Pico has the 50Gummies Recycle Campaign which is just started today! So, We would like to thank this girl for everything! and right after she left... Ranzi appeared right after Choco was gone :O We took a picture too! I`ve been playing in casino since when Ameba Pico`s x5 c$ at Slot Campaign is back. Today. I played with Catgirl at Black Jack ad we were actually winning! And I`m so happy cuz` sounds like a real one family. "One for all, All for one" Love it! I was playing at Casino when I received a message from Catgirl Étoile if we could play together and so, I followed her While playing slots :]tina 'Etoile followed me and we played slots together and our goal was to win the JACKPOT. 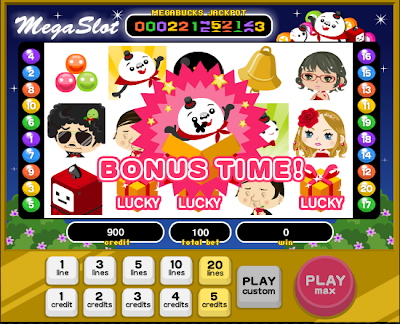 I hope its really easy to win the jack pot since 1 million is really hard to earn. After she got satisfied with her c$. I continued on playing slots while she went at Black Jack normal. :]tina 'Etoile followed me agian, and then we talk about lots of stuffs. I also asked her if I could take a picture of her for her pet`s picture and for my next blog`s layout inside my house. I saw the latest notice of Ameba Pico on their Official blog just now, it was about the FAKE Ameba Pico Admin that I reported/posted last time. And I feel grateful now cuz it`s already gone now. I was really worried that many Pico Users will be victimized specially the AG Users and Well known Picos. So please be aware with hackers. Consider this as a warn from us because it`s really dangerous. Also, be aware with fake ameba Picos. I`ve already encountered some fake accounts and using other`s name specially the known picos. If u expirienced same trouble with me. Don`t hesitate to report it to the REAL ADMIN of Ameba Pico and it`s better to give them some proofs like screen caps. 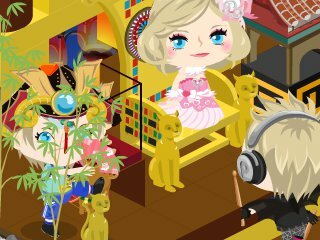 It`s me, MiaRi blogging today:3 Well, Ameba Pico have a new Premium Gacha called "Welcome to Supermarket!! "(Click to visit the Official Announcement). Well yeah, the colors are Blue, Pink and Green. 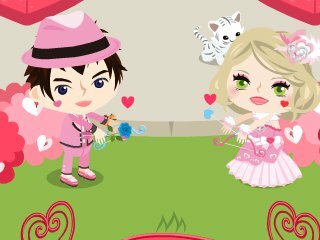 My twin, MaiRie recieved a message from our lil bro, Yasuo about the Green gacha that it`s only 10 gummies and my sis told me about it and we both played the Green Gacha and Completed the needed items to get the wall and apron. When my sister was in meeting of Bosz, I received a message from her sayin "is he green gacha is gone temporarily now?!" and that was the time I noticed that the Green Gacha Machine was gone... and I said "yes, but I`m still playing" and she was really surprised and followed me. I only have 26k now... I spent about 2k today just to get a lots of the items for my house :3 I`m still saving to expand my room... I don`t wanna load for now `cuz I`m still thinking for a unique design of my house :) And yeah... my sis was really laughing when I mannered the pink and blue gacha machine XD And it`s also crazy that the Green Gacha says "I`m the Premium Gacha" and it`s only 10 gummies. AHAHAH! I spent my time with Denise and Devilyn Makitsu inside my house. I was very bored that time and so thankful that they visited me :D Also, this is the firstime they met 3ray and my Brother Yasuo. I also took a picture with Bosz JP and Bosz Nik. I was browsing when I saw some pictures of mine somewhere at Ameba Pico and Chloe`s Page. This was my picture at the meeting of ♠»ßôŠž¬ clan last sunday while waiting for the other members. Me and Chito at the park(I posted this last time). And the bad news about this. Someone posted THIS picture and it says there... this is his entry =___= but NOT! I want you all to be careful with the messages you`ll receive about Ameba Pico. Well, a while ago... I received a message from AdmIn Pico and it was really crazy! It was a bad notice and many people would believe. The message was sounds really true, but I`m not a fool to believe. If it is the REAL Pico, it would send a notice directly on the game.. I think this guy is try to hack me or something and it`s really a bad ideal and will never fool me. I was really surprised when I received this first message and my heart beats fast. I was like "huh? What did I do??" And keep on thinking of the reasons and then I check out the page and it looks like fake. Nothing was there... everything was private. And then few seconds past... I received a message again. SO BAD. AdmIn Pico was asking me to visit a site. LAWL YEAH... maybe that`s a fake link...and when I open it... it might be possible that my account is already hacked. Since Ameba Pico`s security became strict, there`s no other way to hack your account unless they get your E-mail and Password. Don`t let your Pico ID Stolen! !